An ideal set for gunmakers, woodworkers and machinists who require a smooth, polished edge on their tools. Great for putting that extra keen edge on the special shape wood chisels often used in muzzle-loading stock making. 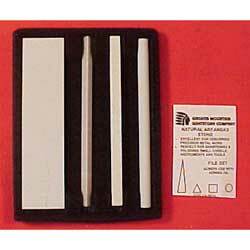 Includes a square, triangle & round file, each 4" x 1/4", plus a knife blade file tapered 4" x 1" x 1/4" x 1/16". All made of fine grain material hard Arkansas stone. Set of four files in a plastic storage box.